I was going to go for a roll this morning, early so I could be back in time to go for a roll with the Dawns, but after being too lazy to organise it, I found myself also too lazy to go solo. Thus, today featured just a lovely roll in the sun with the tiny Canadian. I wanted a little test of my knee. It's been on my mind, but I think that's simply because I've been mindful of it. Anyway, I sent Bing yesterday to tee up an early roll down to Frankston, and then rocked up to find we had a solid 8-10 blokes including the ever quadtacular DK. I was mentally preparing myself for a Wednesday long loop, but instead we hit a bunch of stuff used by the VIS boys. Pretty much instantly there were divisions in our group along ability lines, and I did my best to go with the Bing and DK one. I managed to too... but given they were chatting, I think it had more to do with them taking it easy before racing tomorrow, than it had to do with my own fitness. So today's test included seated around the loop Bing devised, and chopping off in the Rush shoppy from Mordi. On the other side of the equation, the recovery and rehab side, I got a new longer, and firmer foam roller, a hard "massage" ball, and a big elastic band to help beat the muscles controlling my knee into submission. The band is odd and the ball is evil, but I've got mixed feelings about the roller. It's harder, and thus hurts, but it gets in better and I don't fall off it easily. It's a little known fact, that Jean-Paul Sartre was first drawn to his thoughts on Existentialism when out for a ride, he realised he'd forgotten to start his garmin, and thus had no record of the distance already travelled. This crisis lead to the famous notion that "existence precedes essence", and still applies to riding today. If a ride isn't on strava, does it really exist? Right at the start, it seemed like no one was interested in doing much today. We didn't roll out until 6:02, and then it was just a bit of a lazy two up roll. Gradually the pace lifted, and soon enough it was single file for 20-30 riders. I never felt super stretched when on a wheel, but if a surge or inattention caused a slight gap, it took a concerted effort to close it. Given the fast pace, the only time I hit the front was coming out of the golden mile. We got some lights, and I decided I'd do my bit to get the sprint train started. I got on the front and worked to get things going, had a look back to ensure that everyone was on, and realised that I had pulled Jono Cantwell and myself clear. I gave a perfunctory "we're on" and nailed myself for a few hundred metres to make the gap as big as possible as quick as possible. I rolled to the side, getting ready to grab Jono's wheel and fully hate life... but he soft pedaled through and I pulled the chute, the impetus was lost. I haven't been on the foam roller much this last week, and suddenly my ITBs are tight like I've been cracking out back to back 600km weeks. So I got back out the evil, foam cylinder and started the process of getting them moving again. I rolled a turn here or there, probably like 3 in total, but the pace was pretty decent and I was getting a reasonable workout just hanging out in gold class. What I did do was use any small gaps, and the BP sprint as a chance to practice holding low form out of the saddle. It still feels odd, and after 4-5 pedal strokes the smooth action breaks down and it's a bit pig rooty. I recall Dunny saying for him the sprint stops when the form fails. I believe he is trying to reinforce only the proper behavior, much like how I try and teach track standing (if you're going to fail, pedal out rather than clip out). I might keep that in mind next time, and only sprint for as long as I can sprint smoothly. Ok, so I worked out where I read the piece on childhood sports development that I couldn't remember last Thursday. It wasn't an article, and I didn't read it. It was a Tedx video linked by Carl, and it's worth the 14 minutes of your time to listen to it. It's very likely that when Steve and I used to ride the Yarra trails on our hardtails regularly, we did so faster than we did today, but that didn't decrease the fun we experienced this morning. The epic downpour last night just added petrichor to the air, rather than making a boggy mess like we both feared. I doubt we were the only ones to fear a mess either, as we mostly had the run of the place right up until several hours later, when we parked our clean, dry arses at Three Bags for a coffee. We rode up and down, in and out, and often found ourselves riding a memory of the tail, rather than what it currently is. Hopping over things that have long since eroded away, and taking lines that have since been replaced by years of paws, feet and wheels. Remembering times when we'd chased world champions past rocks and trees, or fished others (and ourselves) out of the brown Yarra waters. A slight northerly made the roll down easy, and kept the work home honest. The trip back with the fast group consisted of rolling turns with Jimbo, Dave Sewell, Ben Abels, and couple of others. I took a couple of sits when I felt over extended, but mostly forced myself to keep moving onto the wheel going forward and putting myself into the wind. It's a slightly slower ride than Northy,but that means I can spend more time on the front, and that makes it better training stimulus right now. I used to dream in black and white, though I've since started dreaming in colour. I prefer the latter, though I'll be the first to admit it's just a pigment of my imagination. DK wanted an easy roll, and I wanted croissants. We had a good chat about something Carl first introduced me to, the conundrum of developing good junior athletes. It's a conundrum, because in a super over simplified way you need to push people to be their best, but if you push kids too hard, you end up breaking them, and then you have no kids to push. As a nation, we've crafted a system that's going to keep chewing up a heap of kids, simply by the nature of how we fund sport. The sports that win world and olympic medals get the funds. So, all the sports academies (AID, VIS, etc) are geared very heavily towards producing gold medal winners. DK was obviously a product of those institutes, and though he's a phenomenal athlete, and an even harder worker, he's not overly praising of his experiences. I read an article the other day, and for the life of me, I can't remember where, nor find it with google, about this very topic. About how to shift the focus from winning, which has a lot of negative impact, to something else. Their secret elixir was the phrase "I love watching you play". If you google it, you'll find many people have latched onto it as the fountain of fun. It's not about saying that winning doesn't matter, it's that it's not the most important thing. Anyway, I think this whole thing is an important topic for people who care about their kids, and/or people who care about their sport. Forgive me if I've covered this idea before, but it's been bouncing around my head since a comment Dunny made during crit season. He was talking about practicing sprints, and in my mind it was about the technique, rather than the horsepower of it. Regardless, that's what my thoughts have been about. I know I generate some decent power numbers for a roadie, though my kick is somewhat muted by my weight, but even taking a kick out of it, I'm often out gunned top speed wise too. So, technique, or more to the point, body position on the bike has been on my mind. I like a short sharp kicker of a hill/sprint, I can generate awesome power numbers, but like a gate start, my torso is pretty upright. At high speeds that cant be doing me any favours. So, the thought that has been bouncing around in my head, is to practice the low torso sprint. As I ended up being in the leadout position this morning, I didn't get a chance to try, but I did slip in a quick one on my way home. It feels odd, and the power wasn't anything to brag about, but it bears more practice to see if in time it delivers a different sprint outcome. From what I can tell, based on my view from 15-20 riders back, and from what others are saying, this morning was a Tommy Leaper pacing session. It seems the calves are in good form, and not many had the strength to roll over the top of him. I think I've mentioned my next step in knee issue discovery is to get some blood tests done, and it feels likely I'll also need to take a break off the bike. Logically I should take this as a time to give a pint or so of blood, rather than just a couple of vials, and then ease back on the riding even more until hemoglobin levels return to normal. You know, might as well help some others while I can't help myself. I've pulled up a bit sore in the knee region after yesterday. I'm also tight in both ITBs and I've got a massive case of CBFs. One of those is probably a valid reason for why I didn't ride today. There wasn't much interest shown at Mordi for a fast/slow group split, but I knew I'd he happier afterwards if I got some hurt in, so I made a fast group happen anyway. Dave Sewell and I swapped off the whole way home, with a few others contributing when and where they could. Our breath fogged in the cold morning air... well I assume it did, it was hard to tell given the amount of regular for there was getting about. Can someone tell me if the yarra trails are in half decent shape or are they a soggy mess? Hopping gutters on the hard tail is fun, but it's not quote the same as hitting dirt. What a northy, it was flat out like a reunion. Skinny, Bones, Rosco, and even Troy van Trinininininen were out for a roll. Troy and Skinny were on the front for the leg into Mordi, so to make sure they felt the love we felt about their return, I attacked full noise as soon as we cleared the roundabout, giggling as I whipped past on the right. The first lights, the ones at Centreway turned to orange as I rolled through, and I knew that the bunch was going to have to stop for the red. I was clear, riding solo into the cold August air. So I reviewed what Cam Wurf had taught me, and set about an effort designed not to get me to st kilda first, but to ensure that anyone chasing, would have to do so above their comfortable uncomfortable zone. I was caught a few km later as we rounded the corner at Mentone, and took a break before getting back to pulling some turns until we hit Brighton and attacks started flying. Coming past Glen Huntly, the sprint just moments away, someone dropped the wheel, and to make matters worse, I had dropped my head so didn't see it until a gap had already formed. So I dumped my legs into the pedals. 500m later I eased left to let the riders on my wheel fly. A quick glance down said they'd had a sit all the way to 57 klicks, and I'd earned myself a coffee. That, that was what Northy is all about. Mates, giggles, drilling it, and coffee. Did you hear about the new range of corduroy pillows? Well, it's making headlines. 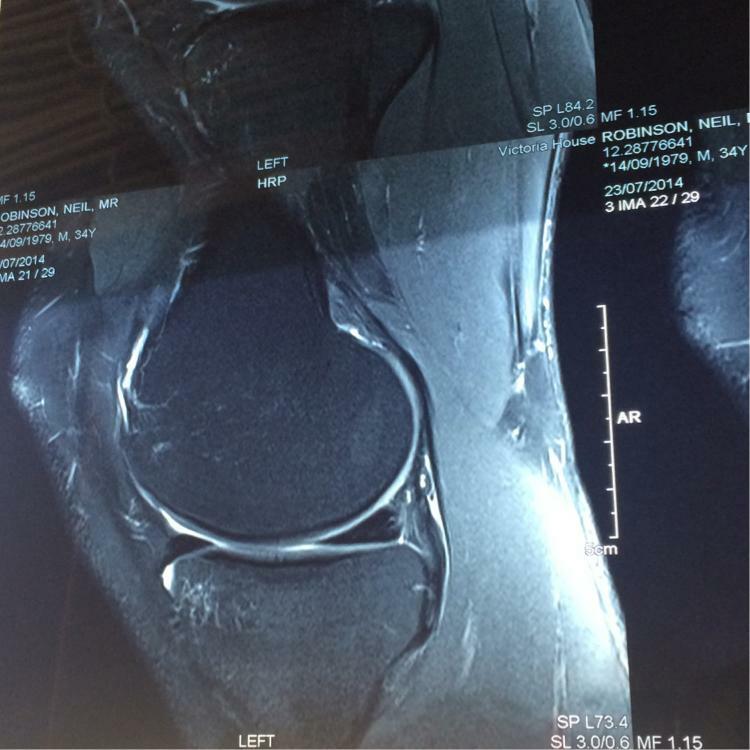 I went and saw the sports physician today, to check out and discuss the MRI slides. The good news is there's nothing obviously wrong with my left knee, the bad news is there isn't anything obviously wrong with my left knee. If there was an issue on the MRI, then I'd have something to work to fix. The only thing that can be drawn from the $300 worth of scans is an area at the top of my fibula that wouldn't really classify as a stress reaction (a precursor to a stress fracture), but as it correlates with the area of pain, it's what the doc is concentrating on. In the pic below it's the tiny whitish lines on the top left of the lower bone. So, the treatment is continued reduced load (5-10 hour weeks on the bike). He also wants to run some blood tests to see if there's anything going on that may have caused a my body to be more susceptible to bone damage. One theory is I might not be eating enough, but I'm fairly confident I've got pure food volume covered. I'm sure the early hours of the day featured some good conditions, clear skies and no wind, but given the ugly I saw before and after the roll with DK down to Patterson River, I was pretty happy with what we had too. There was a Sou'westerly that kept us pushing harder on the pedals than strictly necessary for the trip south, but gave us a few extra klicks on the way home. We didn't really chat much, the wind howling in our ears made it near impossible on the way out, and by the time we turned there were looming black clouds and post ride things to think about. In continuation of the theme, where by I share others' stories because I lack my own, I give you Bolts. I hadn't seen him on the bike in forever, until just the other day I had a 15 second chat with him on Chapel st. This story that popped up just yesterday tells the reason he hasn't been riding better than I could.